Sweet, citrusy granola made with freshly squeezed orange juice, fragrant orange zest, almonds, and dried cranberries. This cranberry orange granola is about to become your favorite fall snack. My obsession for sweet, crunchy granola knows no bounds. This recipe for cranberry orange granola is loosely based off of the flavors in my favorite cocktail, the cosmopolitan. Bright, juicy orange and sinfully sweet dried cranberries combine to create one amazing batch of granola. Granola is one of my very favorite snacks. I keep a small container of it in my purse for snacking emergencies. Hey, you never know when you’re going to have a fierce snack attack. I like to be prepared at all times. Plus, I get cranky when I’m hungry. Granola also prevents me from reaching for a brownie or extra scoop of ice cream. Don’t get me wrong, I love to indulge, but my metabolism is beginning to slow at the ripe old age of thirty. These days, I have to put forth more effort to squeeze into those skinny jeans I love so dang much. Whenever I get the urge to binge eat dark chocolate peanut butter cups, I march right on over to the granola jar instead. It works about 60 percent of the time. One bowl and a rubber spatula are all you’ll need to whip up this recipe. I’m not one to skimp on flavor, so I used the juice and zest of one orange to give this granola a bold burst of orange flavor. If you look closely, you can see the vibrant orange flecks of the orange zest baked into the oats. I used maple syrup to sweeten the granola and give it that classic maple flavor that bakes up and has your house smelling like a fall candle. Um, cranberry, orange, and maple–hello, flavor town. If you want to make a gluten-free version of this granola, swap the old-fashioned oats for certified gluten-free oats. To give this granola some protein and crunch, I added chopped raw almonds and raw sunflower seeds. They toast up in the oven and get cozy with the oats and cranberries. I know I’ve said this about the maple pecan granola, banana maple granola, and cookie butter cinnamon chip granola, but I think this might be my favorite granola recipe yet. In a large bowl, add oats, shredded coconut, almonds, sunflower seeds, dried cranberries, and cinnamon. Stir to combine. Whisk together melted coconut oil, maple syrup, orange zest and juice, and vanilla extract. Gently fold the mixture into the oat mixture with a rubber spatula until evenly coated. Transfer the mixture to your prepared baking sheet, spreading the mixture evenly onto the pan. Bake for 50 minutes, or until golden brown. Do not stir the mixture as it bakes. Place the pan on a wire rack and cool the granola completely. Using your hands, gently break up the granola into bite-sized chunks. Store in an airtight container for up to 2 weeks. Swap certified gluten-free oats for the old-fashioned oats to make this granola gluten-free. Food that makes your house smell like a candle? BRILLIANT. Mostly because I just finished painting some chairs and our house smells like… painted chairs. Thanks, Movita! It’s cheaper to turn on my oven than it is to buy a Yankee Candle these days :) Whenever the house gets a little funky, I bake a batch of granola. Perfect fall flavors to switch up my granola routine! Thanks, Jess! I’ve been munching on it all week. I’m in love! That is fabulous granola – great year round, but it would be wonderful to have during the holidays! Great with yogurt, too! I love sprinkling this over yogurt. Thanks, Mimi! It’s amazing that you based a granola recipe off of a cocktail! Love it! Ohhhh I just love it! I could snack on this granola all day long! The orange/cranberry combo is one of my faves in the fall and winter months – so warm, tangy, and inviting! I need a quadruple batch of this! Gorg! I saw this on pinterest and I haven’t stopped thinking about it since! So pretty! The biggest problem with candles is that they smell so good and you can’t eat them. I will totes take granola that smells like a fall candle anyday! My mom would LOVE this: in fact, i may secretly make her some and send it to her, because it’s nice to do. also, because there would be some left over for me, right? YES. That made me laugh when you said that you say every new granola recipe is your favourite, because I do the exact same thing! I love granola, but always want to change it up to a new flavour combination, and every one is then my new favourite! I haven’t tried orange yet, so maybe that will be my next favourite too! 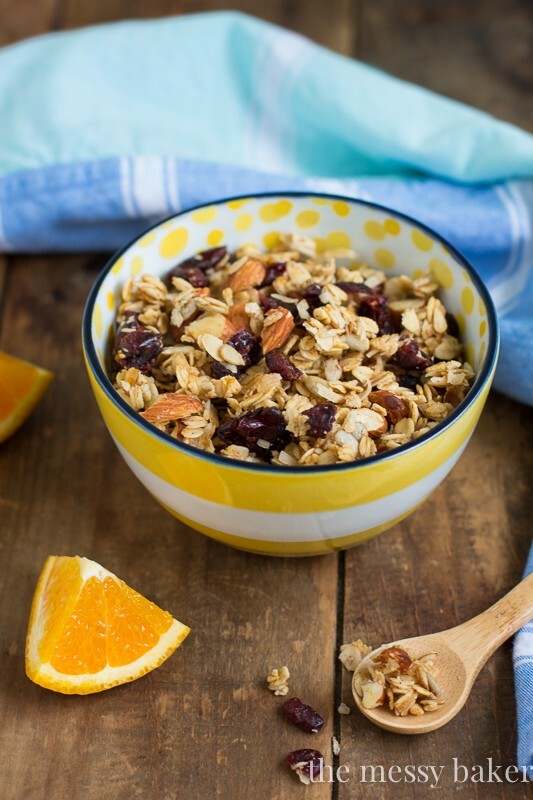 I’m loving the orange zest and orange juice in this granola! I’ve always been a fan of the cranberry-orange flavor combo, but have never thought to do that with granola – yum! Looking forward to trying this. I was seriously just telling my mom how one of my favorite fruit combos is orange and cranberry! All I need to do is throw in either some dark chocolate or white chocolate and I have my sweet fix! Dark chocolate would be lovely in this granola. It’s totally going to happen the next time I make a batch. Thanks, Stef! Yum! What a fantastic combination of flavors! I was looking for a different granola recipe, and found this one. Made it, and the house smelled YUMMY!!!! I bagged it in 1/2c servings in snack bags; gave some to a couple of coworkers, and they are fans! This is the BEST granola I have made, and I will be making MUCH MORE!! YUM!!! !